Thanks to a strange bounce off the side of the out-of-town scoreboard in right-center field Jim Thome tripled Monday for the first time since 2004. Thome went 73 months between triples, during which time he played in 770 games, logged 3,050 plate appearances, hit 179 homers, drove in 508 runs, and notched a total of 643 hits. There were 13 no-hitters between triples for Thome, whose last three-bagger came when Joe Mauer was a rookie and I was in college. 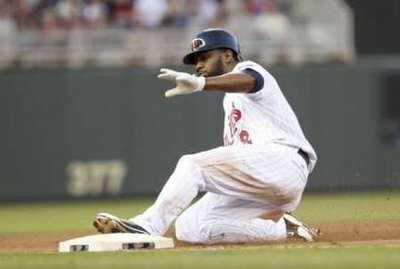 No doubt motivated by watching Thome leg out what must be one of the most leisurely triples of all time, Denard Span amazingly hit three triples in the first five innings last night. 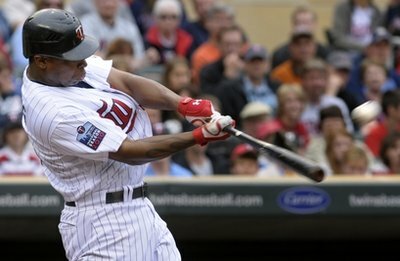 He had a chance to set the post-1900 record with a fourth triple, but walked instead to settle for tying Ken Landreaux for the Twins' single-game record, becoming the first player with three triples in a game since Rafael Furcal in 2002, and leading the AL with seven triples on the season. Better yet, despite a terrible April and several prolonged slumps this year Span is now batting .284/.356/.394, which is within range of his .305/.390/.422 career line coming into the season. Ichiro Suzuki and Elvis Andrus are the only AL hitters with a higher on-base percentage from the leadoff spot this season and since his debut in 2008 the only outfielders with a higher OBP than Span are Manny Ramirez, Shin-Soo Choo, Matt Holliday, J.D. Drew, and Adam Dunn. Early this season it looked like the Twins might run away and hide from the rest of the division, but after yesterday's loss to the Mets they're now just a half-game in front of the Tigers and 1.5 games ahead of the White Sox. 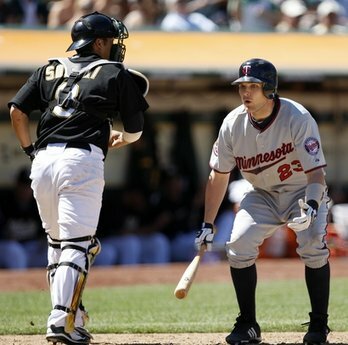 They finished May on a five-game winning streak that gave them a season-high 4.5-game lead, with the Tigers looking like their only real competition and the White Sox on the verge of trading away veterans, but since then the Twins are just 10-14. 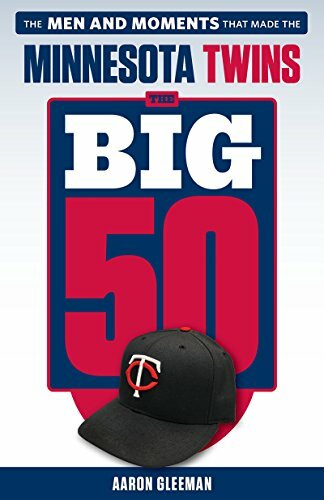 Nearly all teams go through sub-.500 stretches like that, but the Twins' division lead vanished in a hurry because their rough patch coincided with the White Sox shockingly winning 15 of 17 games after beginning the season 24-33 as reports swirled about their manager and general manager feuding. Toss in the Tigers staying steady this month with a 14-10 mark and ... well, no one in the AL Central is going to be doing any running away or hiding for a while. When a bad stretch like the one the Twins are on now follows a good season-opening stretch like they put together in April and May there's a tendency to assume things are falling apart and the team is doomed. Certainly the Twins' recent poor play is discouraging and takes some of the air out of their World Series aspirations, but it's important to put things in the context of a six-month, 162-game season. Had the timing of the good and bad stretches been flipped, with the Twins starting 10-14 and then playing well for two months, the perception of their current situation would be different. It's similar to how a player who follows a big April with a mediocre May through September will spend most of the season with nice-looking numbers, but a player who follows a terrible April with a strong May through September will spend much of the season with bad-looking stats. 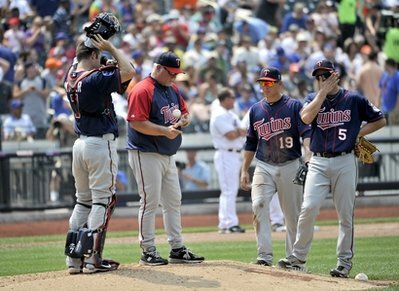 No matter how they got here, it's late June and the Twins are atop the AL Central and on pace for 89 wins. 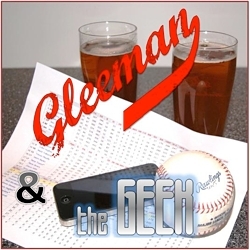 In their first eight years under Ron Gardenhire the Twins' average win total was ... 88.6. Shaking off the loss of Joe Nathan to start 31-20 raised expectations to the point that the current 10-14 stretch has people scrambling for answers and lobbing criticism everywhere, but if offered on Opening Day a half-game lead and 89-win pace would've sounded just fine. Longtime readers of this blog may not think of me as a voice of optimism and I'm obviously not against criticism when it's warranted (and sometimes when it's not), but far too often fans and media members seem to forget that baseball is a six-month marathon of ups and downs. This isn't football or even basketball, and treating each winning streak or losing streak like it is will just lead to overreactions and hyperbolic analysis. Without question the Twins' recent play is worrisome and exposes some flaws that likely need to be addressed, but whether it comes in April or June or September winning baseball teams are going to experience stretches like this and baseball fans should probably know better than to react as if they're doomed. Right now the Twins look like a good but not great team capable of winning a poor division, which was true on Opening Day and for most the past decade. And now the Tigers are in town for a three-game series at Target Field. This winter the Twins signed Brendan Harris to a head-scratcher of a two-year contract, oddly committing $3.2 million and multiple seasons to a thoroughly replaceable 29-year-old bench player with a substandard glove and .267/.324/.396 career hitting line. Yesterday they passed Harris through waivers unclaimed, removed him from the 40-man roster, and demoted him to Triple-A, calling up outfielder Jason Repko from Rochester to replace him. Repko is the same age as Harris and is no great shakes himself, hitting just .226/.297/.371 in 478 trips to the plate spread over various stints with the Dodgers. However, most of that poor production came when he was a 24-year-old rookie in 2005 and Repko has hit .289/.357/.461 in 382 games at Triple-A. He's a decent enough right-handed bat to warrant some playing time over Jason Kubel against lefties and rates as a good defensive center fielder. Harris has always been a tweener, because his glove isn't strong enough to be a viable option at shortstop or second base and his bat isn't good enough to be an asset at a less demanding position. And that was true before he hit .157 in 120 plate appearances this season. Normally the Twins would've simply cut him loose, but because they're paying him $1.45 million this year and still owe him another $1.75 million for next year Harris will remain in the organization. Between the Harris move and another ugly start by Nick Blackburn, yesterday wasn't a great day for handing out unnecessary multi-year contracts to players who were under team control anyway. I'm curious to see if Ron Gardenhire is willing to actually use Repko versus lefties or to at least give Denard Span days off, but either way a legit fourth outfielder was needed more than ever now that Michael Cuddyer is apparently MLB's worst-fielding third baseman.